The relationship between finger clicking and carpal tunnel stress measured by Ergometer. Why mousing leads to Carpal Tunnel Syndrome? (also called Repetitive Strain Injury)? Most conventional mice force the hand, wrist, and forearm to be twisted away from the natural and relaxed position. This requires constant strain applied to the hand, wrist, and forearm in order to maintain the position. The unavoidable twisting is a strain on the related muscles, tendons, and nerves. Why Rockstick 2 is born to relieve Carpal Tunnel Syndrome? The concave depression on the thumb side of the mouse combined with the downward slope towards the mouse towards the fifth finger positions the hand at a 60° angle off the horizontal, which is a more natural position for your wrist and forearm. The unique design of the Rockstick mouse allows users to click by utilizing the strength of the entire hand instead of fingers alone.The repetitive strain on fingers eventually leads to inflammation and swelling of the finger flexor tendons. 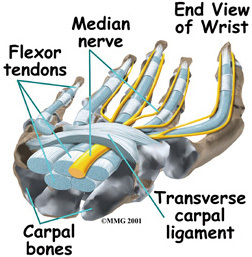 Carpal Tunnel Syndrome occurs when swollen finger flexor tendons compress the median nerve, which runs from the arm to the hand through a space in the wrist called the carpal tunnel found under the transverse carpal ligament. The slanted semi-fist shape of the handle design allows gravitational force on the hand to be employed to provide the majority of the control required to precisely move the mouse; The need to grip the mouse which is one cause of hand fatigue is largely reduced. The Ergo-Grip design with detachable ledge keeps the underside of the little finger and palm off the surface of the desk. Also the downside of wrist doesn't press the desk surface anymore. The unique design of the Rockstick mouse allows users to rest fingers on the handle without preparation to click, all fingers remain relaxed and supported at all times. The ambidextrous design of the Rockstick 2 mouse allows users to operate by either the right or left hand. This feature enables users to work balance throughout the day by distributing the repetitive actions of mousing to both hands, thereby providing rest periods for both hands. Copyright © 2009-2014, Microtouch Technology Inc.